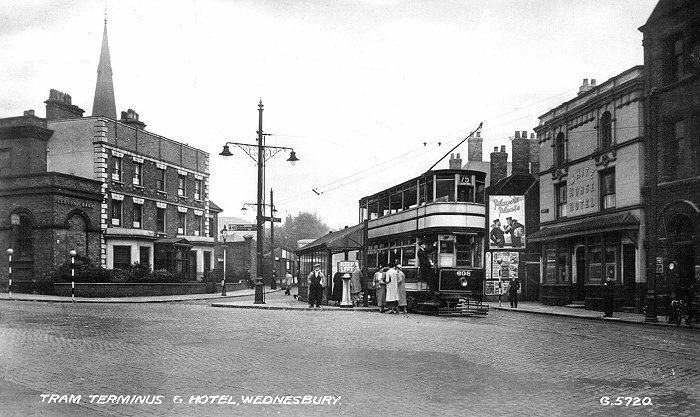 Wednesbury, like its neighbours, exploited the plentiful supply of local minerals and saw some early industrial development as a result. 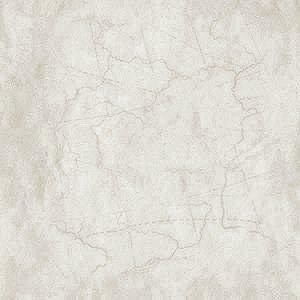 Its industrial growth was very dependant upon good roads, canals and later railways. In the early 18th century the roads were still in an awful state, some of the best being nothing more than well-worn cart tracks. Most of the roads had deep ruts and so where unsuitable for wheeled vehicles. One or two of the better ones such as the Portway or possibly the Market Place were causeways of cobble stones, called "stoneroads". In his papers John Wesley described a quagmire on the outskirts of the town, known as Hoo Marsh "where the road was in a ruinous condition". Pack horses were used instead of wheeled vehicles, and fitted with panniers called "dassells" on which to carry heavy items such as coal or iron. The Act allowed authorised Trustees (usually made up of local businessmen) to collect tolls for 21 years in return for repairing a particular road. Accordingly turnpikes (a gate or barrier) were set up to collect the tolls. Parliament created the first turnpike trust in 1706 and their numbers rapidly grew, so much so that by 1830 there were around 1,100 of them, created by some 4,000 separate acts. The tolls were paid by users once a day for the whole length of the road, and regular users could pay quarterly. The old tram terminus next to the White Horse in Bridge Street. Two turnpikes were set up in the town for the road to Birmingham. One was in Lower High Street and the other in Upper High Street near the High Bullen. Because large numbers of carriages and carts used the road, the repairs had not been completed within the allotted time span, and so the Act was extended to 1748 and again to 1771. Thanks to the turnpike acts the local roads were greatly improved and later augmented by the coming of the canal. In 1787 the Act was Passed for the making of a new road from Wednesbury to Darlaston starting at Trouse Lane and going across Kings Hill to produce Darlaston Road. The original routes to Darlaston were either via Bilston Road, Dangerfield Land and Woods Bank, or via Park Lane and Walsall Road. The new road was a more direct route and a great improvement. 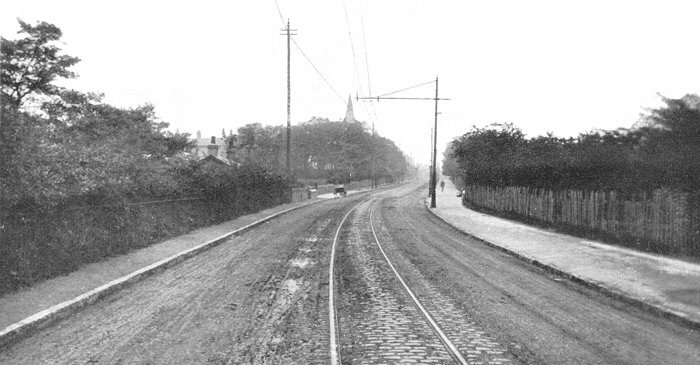 The last major road development before modern times was the building of Telford’s Holyhead Road. Thomas Telford the talented Scottish engineer, surveyed the route and presented his plans to Parliament in April 1811, though it took another four years before the funds were authorised. The new road took 11 years to build at a cost of more than £500,000. The section through Wednesbury was completed in about 1826 and placed under the Bilston Turnpike Trust who built a toll house at the top of Dangerfield Lane. It provided a much improved route to Birmingham and Wolverhampton, as well as further afield. Another view of Wood Green. From an old postcard. The local canal network, the Birmingham Canal Navigations (BCN) was built to transport coal from the Black Country coalfields in the Wednesbury area into Birmingham. James Brindley surveyed a possible route in 1767 and during the following year an Act of Parliament was Passed to allow the construction to go ahead. James Brindley was appointed as engineer to the newly formed Birmingham Canal Company, and work soon got underway. The section from Birmingham to Wednesbury opened on 6th November, 1769. The canal reached Wolverhampton in August 1771, and the final section to Aldersley Junction opened on 21st September, 1772, just 8 days before Brindley's death. The circuitous route followed the natural contours to avoid as much large-scale engineering work as possible, and the total distance of 12½ miles as the crow flies from Birmingham to Wolverhampton, was covered in just over 22½ miles. The canal was a great success. Large quantities of coal, limestone, sand, and Rowley ragstone were transported far more cheaply and quickly than ever before, benefiting both the canal company and the mining companies alike. The canal company went from strength to strength as the canal expanded and other canal companies were taken over. The Tame Valley Canal from the Crankhall Lane Bridge. In 1783 an Act of Parliament was passed that allowed the existing canal at Wednesbury Holloway to be extended from Ryders Green to near an old mine pumping engine at Broadwater. 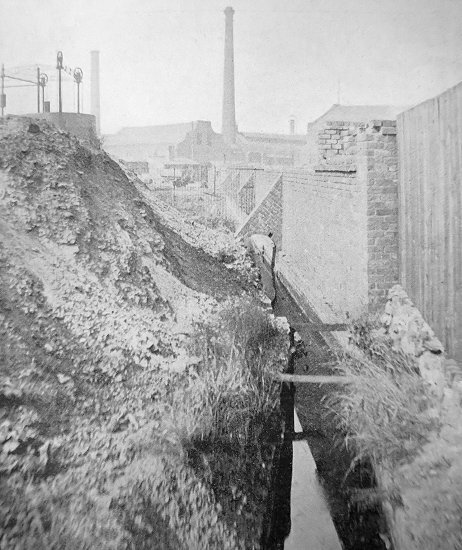 Under the terms of the Act, all the mine owners who had pumping engines had to raise the water from their mines to the level of the canal at Willingsworth, and arrange for it to be fed into the canal, to maintain its water level. One of the water feeds came from the pumping engine at Hobbs Hole Colliery which belonged to the heirs of Richard Parkes. The water course became known as 'Quaker's Gutter', possibly because one of Parkes' heirs, his grandson, Sampson Lloyd the third, had a grandson, Samuel Lloyd, who became known as 'Quaker Lloyd'. 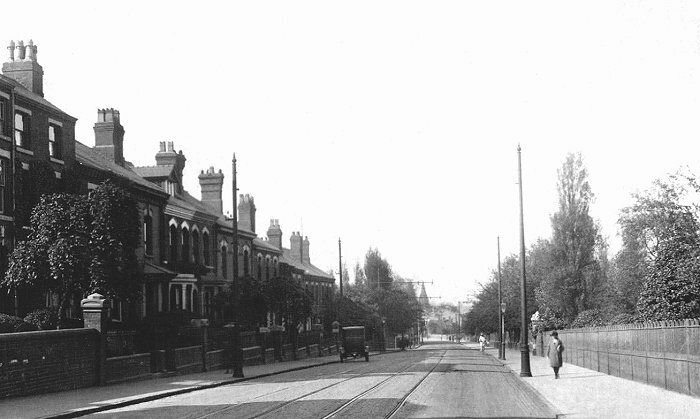 An Act in 1874 allowed the Broadwaters branch to be extended through Darlaston to Walsall, and the whole stretch from Ryders Green to Walsall became known as the Walsall Branch. By the 1820s the BCN carried a lot of traffic which was greatly hampered by the circuitous route. Something had to be done to speed the flow of traffic and so in April 1824 the engineer Thomas Telford was engaged to survey the canal with the idea of shortening and improving the route. 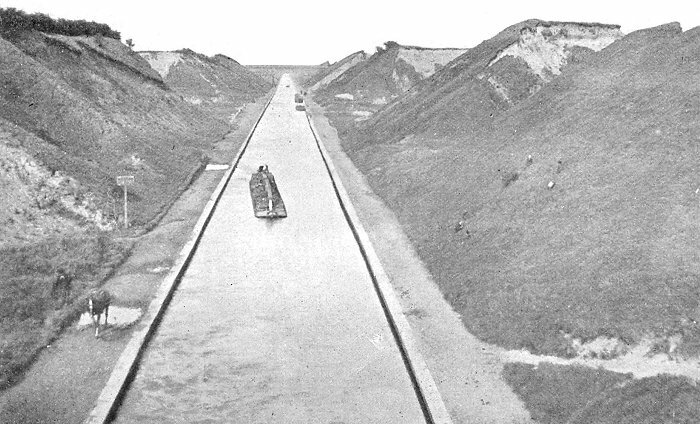 Many of the bends were cut off and a new straight line was built between Smethwick and Bloomfield, which shortened the canal by 7 miles. Later engineering work included the building of the Netherton Tunnel in the 1850s. The BCN was leased by the London & Birmingham Railway in 1845, and from 1846 by its successor the London & North Western Railway. The first railway to be built in the area was the Grand Junction Railway, which linked Liverpool and Manchester with Birmingham. It skirted the north eastern edge of the town, with a station at Bescot Bridge, which opened at the same time as the railway on 4th July, 1837. The locomotive "Wildfire" pulled the first train, consisting of passenger and mail coaches. A year later links with London were improved with the opening of the London & Birmingham Railway, which would soon join forces with the Grand Junction Railway in the formation of the London & North Western Railway in 1846. 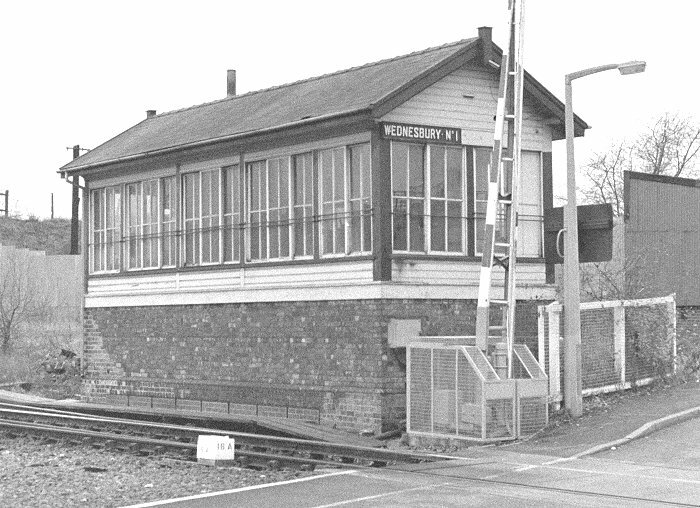 Wednesbury's last signal box, the old LNWR box in Potter's lane. 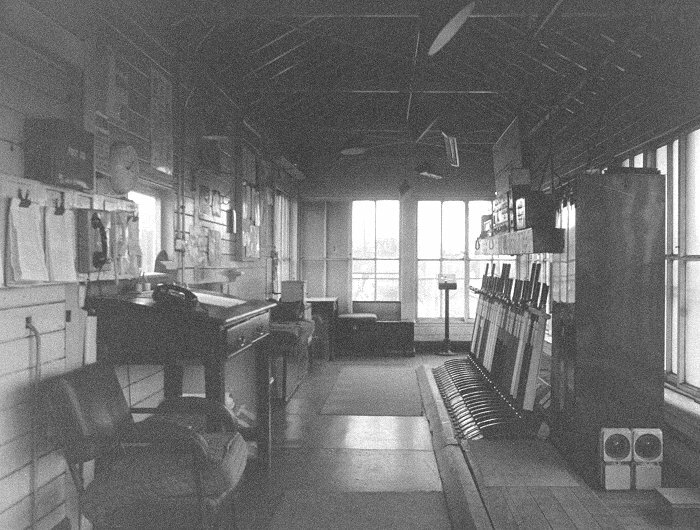 The interior of the London & North Western Railway signal box. The signal box, as seen from Potter's Lane. The signal box entrance. Sadly the signal box was destroyed by a mindless arson attack in 1995. The South Staffordshire Railway built a line from Walsall to Bescot Junction in 1850. 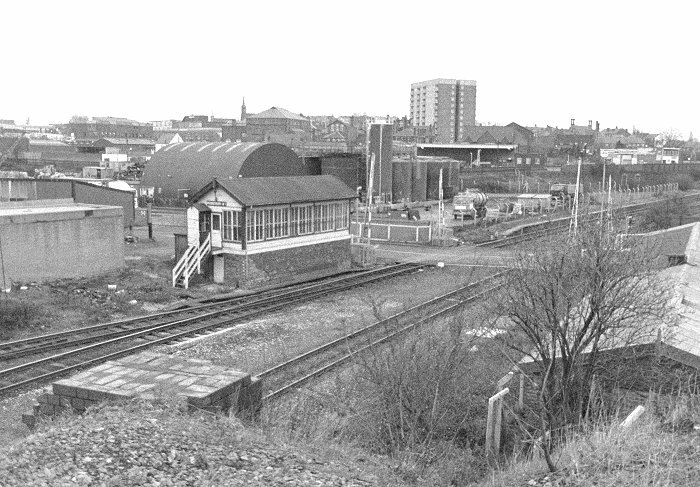 In the same year Bescot Bridge Station closed to be replaced by the existing station at Bescot Junction. The South Staffordshire Railway was extended in 1863 with the building of the Darlaston Branch, which ran from James Bridge, through Darlaston and Wednesbury to Princess End. 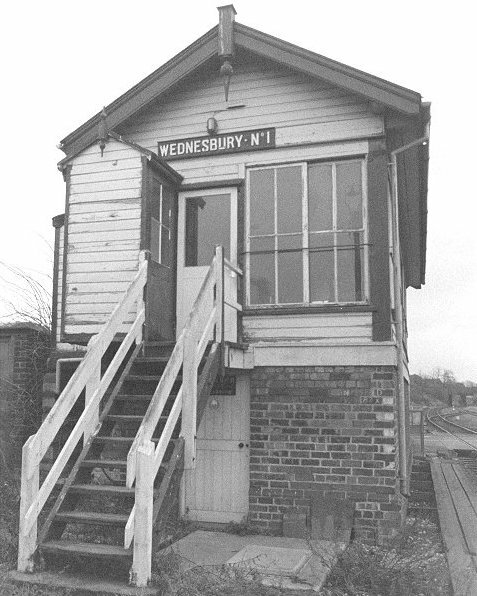 It resulted in the building of Wednesbury's first town centre station. The line officially closed in 1964 but the Walsall to Round Oak section continued in used until March 1993. 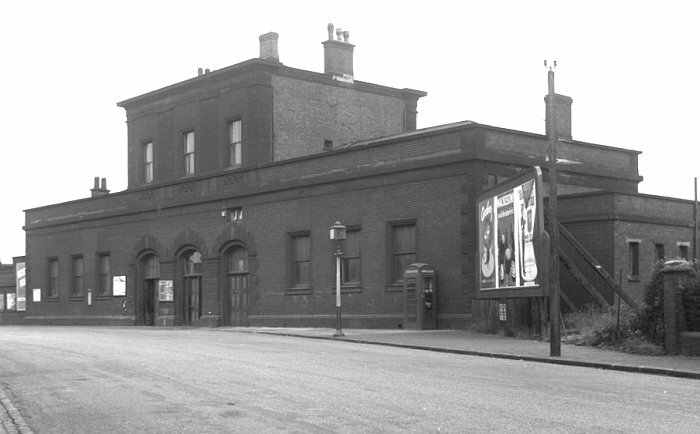 In 1881 Wood Green station opened on the site of the former Bescot Bridge Station and 6 years later passenger services to Darlaston were withdrawn due to competition from the local tram company. Wednesbury's other town centre station opened in Great Western Street on 14th November, 1854 when the Birmingham, Wolverhampton & Dudley Railway began its operation. The railway was part of the Great Western Railway and initially had mixed gauge track, until the broad gauge was abandoned in 1869. The future of the line was in doubt from the time of the electrification of the West Coast Main Line. While the electrification work was in progress the ex-GWR line did see a large increase in traffic, but once the West Coast Main Line had reopened, services were quickly reduced. 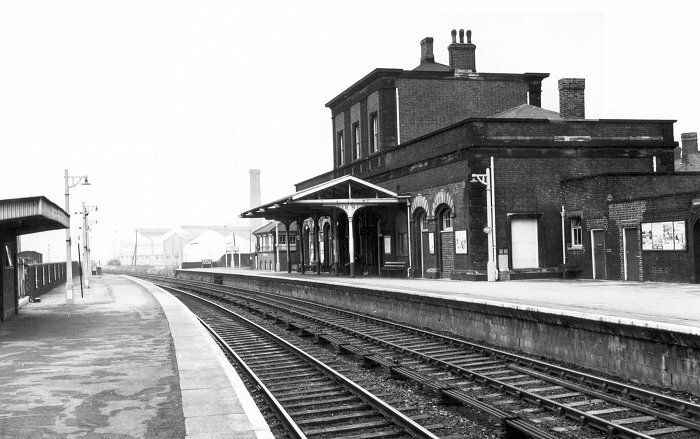 The last Paddington to Birkenhead express ran in March 1967, the line closed in the early 1970s and Wednesbury's old Great Western station was soon demolished. The line is now used by the Midland Metro, and carries more passengers than ever. 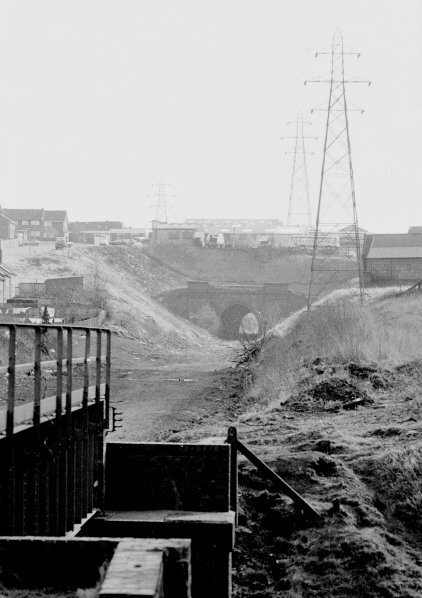 Hill Top tunnel, before the Midland Metro. The Great Western Railway Station. The Great Western Railway Station, seen from Great Western Street.